What Are the Benefits of Outdoor LED Lights? Millions of people watched the New Year’s Eve ball drop from Times Square this past year and were in awe of all the different, beautiful colors it exuded during the wait and descent. Did you know that the ball is illuminated by LED light? 32,256, to be exact. That’s a LOT of LED lights and the palette that was used was capable of producing over 16 million different colors. How cool is that? You can bring the magic of LED lighting right to your backyard, too. LED lights make a great addition to any outdoor lighting scheme for a multitude of reasons. Long lasting – You would have to operate your LED lights for 11 years straight, without turning the off, for the lights to actually burn out. While the startup costs for LED lights can sometimes be large, they’ll more than pay for themselves over time because you’ll almost never have to buy new replacement bulbs. Energy efficient – This is why most people choose to go with LED lighting. Saving on energy costs is a huge perk, especially in the summer, when you’re spending quite a bit of money running the air conditioner. They’re also energy efficient and ecologically friendly because it takes less work and less emissions to transport and run LED lights, since there are fewer of them necessary to manufacture. Durable – Any light that you put outdoors needs to be able to stand up to the elements. LED lights are shock resistant and weather resistant, so not only will they rarely burn out, but they’ll rarely need replacing due to wear and tear. LED lighting will survive even the harshest Baltimore winter or summer storm. Diverse design – You can dim LEDs, change their colors, add effects, and simply illuminate. They’re incredibly diverse and work for just about any lighting needs, indoor or outdoor. 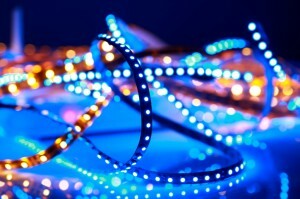 LEDs can be very bright, but run on low voltage and don’t require a lot of energy. They’re even better than CFLs for energy and diversity. They take no time whatsoever to brighten, but are illuminated as soon as you turn them on, which is great for the outdoors when you immediately need to see something at night. LED lighting is becoming increasingly popular in the Baltimore area; you may have noticed that even the street lights along the beltway are now LEDs. If they’re good enough to light the road, they’re more than enough to light your yard! For more information about exterior lighting in Baltimore, Maryland or the surrounding areas, call Aqua-Bright today at 410-489-9009 or take a tour through our website. Illuminate yourself and follow Aqua-Bright Irrigation & Illumination on Facebook, Twitter, Google+, and LinkedIn! For examples of our work, check us out on Pinterest, too. This entry was posted on Friday, May 9th, 2014	at 9:00 pm	. You can follow any responses to this entry through the RSS 2.0	feed. Both comments and pings are currently closed.